Have you seen the beautiful jewelry that Taylor is making and selling at Dames a la Mode? She has collet necklaces, various styles of earrings, and occasionally bracelets in all sorts of fabulous colors that will match any outfit you might have in your closet. Beautiful jewels in a reasonable price range! 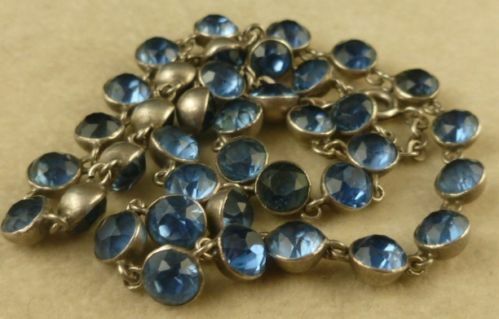 Original collet necklace c. 1800 that was recently listed on ebay. Look at how similar they are to original pieces! Here are links to my 18th century and 19th century jewelry boards on pinterest so you can see more original examples of this type of jewelry. Now you, too, can have lovely, sparkly, wonderfully beautiful jewels to wear to events. 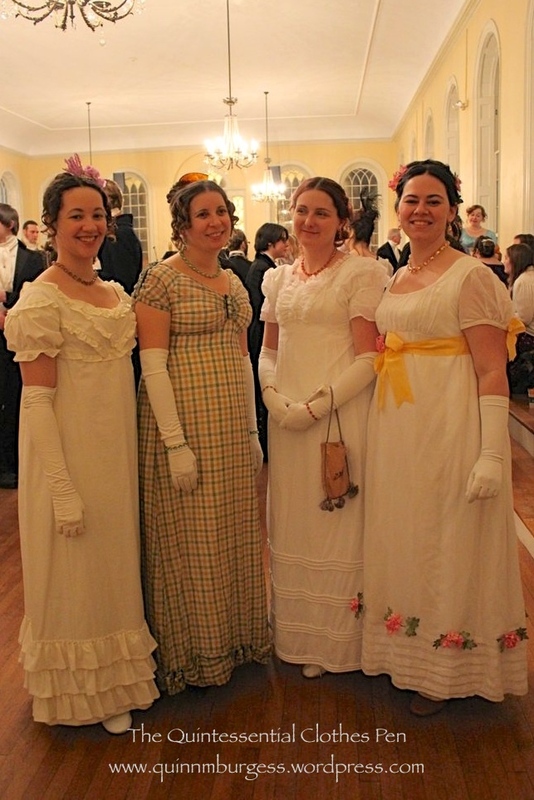 In fact, at a recent Regency ball there were four of us wearing Taylor’s fabulous jewelry, including Taylor herself. It was my first wearing of the matching lavender collet necklace and double drop earrings that I purchased back around Thanksgiving. 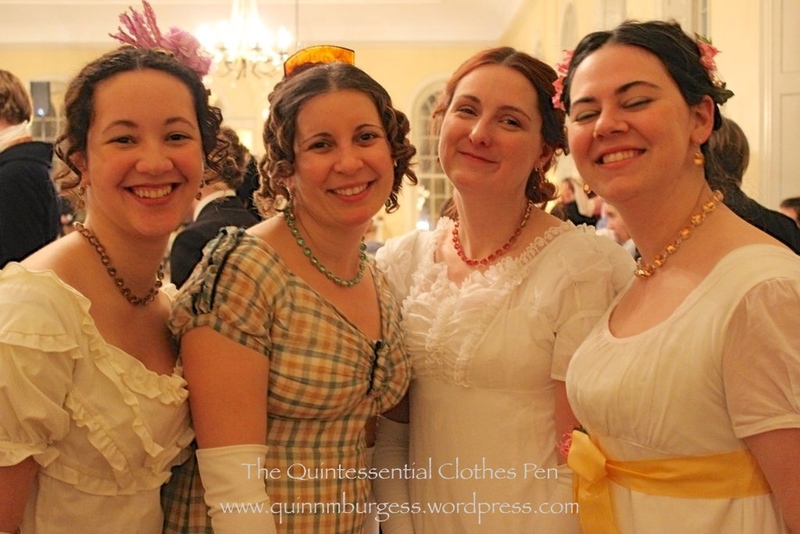 I received lots of compliments and really enjoyed wearing them. Matching, but unique to each of our looks. A close up of the jewels! During conversation, when I mentioned that I liked the dark blue sapphire-like necklace that Taylor had in her shop at one point, she made a good point, which is that lighter colors tend to sparkle more in moderate or dim lighting. Darker colors only sparkle with bright lights, which isn’t often the sort of lighting you find at a ball or dinner or other evening event set in the late 18th or early 19th centuries. Makes me glad that I decided on lavender rather than sapphire! More on the ball next time! This entry was posted in 1810s, 19th Century, Accessories, Wearing Reproduction Clothing and tagged 1810s, 19th Century, Accessories, Jewelry, Regency. Bookmark the permalink. 2 Responses to Jewels! Jewels! Jewels! Unlike the original, the repros have claw settings( the originals are bezel set) so you’ll need to be careful as claws are notorious for loosing stones, but then pastes are cheap and the lady who made them ought to be able to repair them. Thank you so much for your kind words, Quinn! I’m so glad you like your necklace,and it looked wonderful on you at the ball!